With my Summer Finale shoe having been launched and already pre-selling like hotcakes, I am already Fall-minded and looking toward my new projects for Back to School. With September being the benchmark for the start of the season, one cannot ignore the significance of September 11. 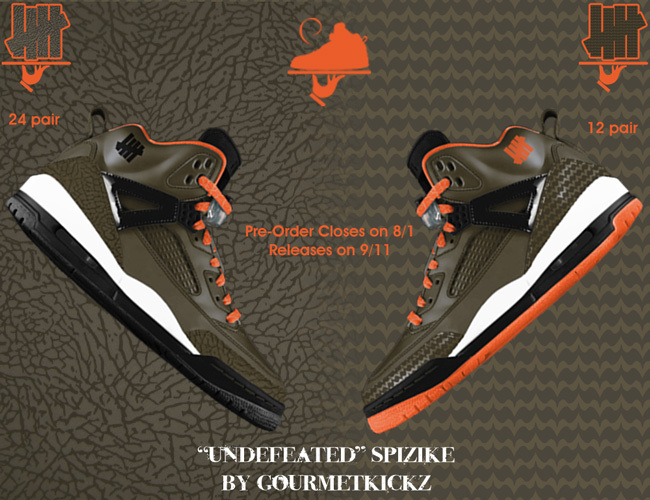 I decided to launch my Custom “Undefeated” Jordan Spizikes on 9/11 because in a way our nations recovery after such a devastating attack is representative of how we as a nation are quite undefeated. 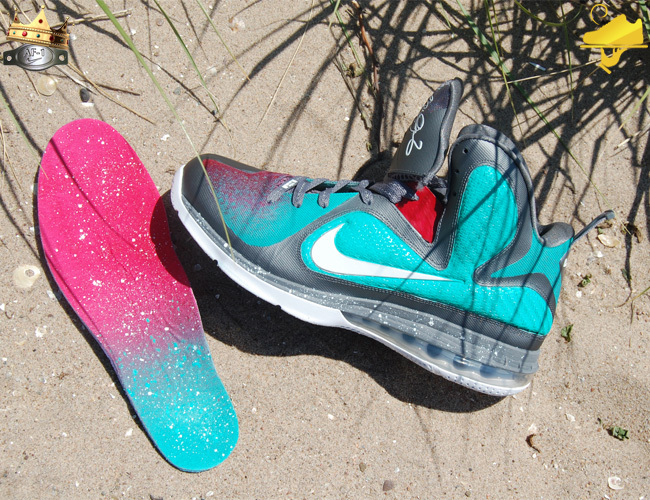 The custom project itself uses a base shoe from NikeID and transforms it into what you see above. There are 2 version; one which keeps the elephant print panels and has me painting them tonal olive along with the rest of the shoe and one that calls for my precise painting skills to replicate UNDFTD’s SAS Print on painted olive patent leather panels. The latter sports a translucent orange outsole and orange UNDFTD logo, while the prior sports those elements in black. There will be a total of 36 pair made, 24 pair of the less complicated elephant printed shoe, and 12 pair of the more complicated SAS Print version. All sizes are booked before construction so there will be no pairs left over. Pre-orders will be cut off on August 1st, orders will begin shipping on September 11. Enjoy! 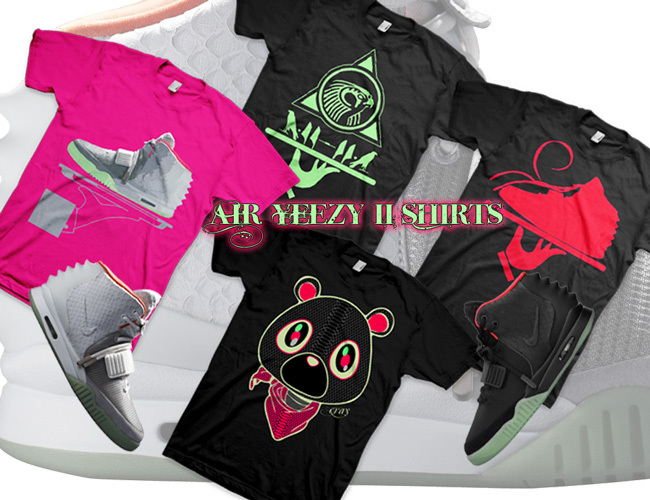 If you have been scouring the internet in search of a great Nike Air Yeezy 2 t-shirt search no more because AF1King is surely the ONLY website you will need to purchase these tees from. The front-runner and most anticipated of these shirts is the glowing “That Shirt Cray” design which has been on pre-order since the Yeezy 2’s were announced and is finally shipping after some color tweaks. The other styles feature the Air Yeezy II silhouette atop GourmetKickz iconic Chef tray and hand in true “Now Serving” fashion. There is even a “Deluxe” version of the “Now Serving” tees which features an animated version of the Yeezy 2 atop the tray. You can even find a glow in the dark “Now Serving” shirt as well as a “Now Serving Horus” shirt which features the logo from the tongue of the Yeezy II atop Chef’s tray and hand! Cop some shirts after the jump or head on over to the shirt section of the site and load your cart up. Every shirt is made to order, making them each a limited edition. Many of you have seen the MVP LeBron 9 which features a different color interior and exterior as well as some cool fading on the flywire. Well this custom sneaker uses that exclusive as inspiration. The colorway is derived from the popular South Beach Theme using filament green and flamingo pink for the exterior and interior panels respectively. The flywire fades from one color to the other in a Miami Night-like fashion. 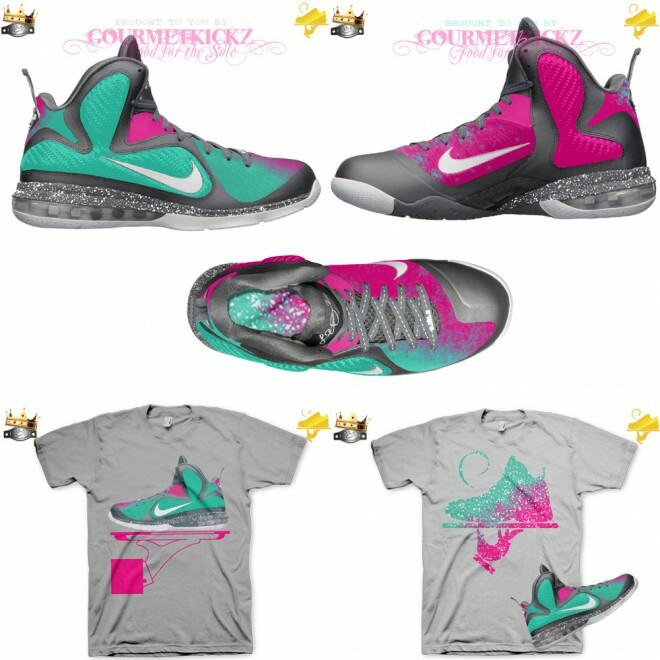 The insole is also customized and custom hook-up tees are available. All of this is now live in the AF1King Shop in the South Beach Diet section. Or you can cop after the jump. By the way my dearest gluttons, this launch marks the last of my custom sneakers for the remainder of the summer. I will be taking a short hiatus and returning with a vengeance come back to school and fall. In the meantime, sans new releases I will be working hard in the kitchen to fill all orders placed up to this point. Bon A Petit! and Ciao!